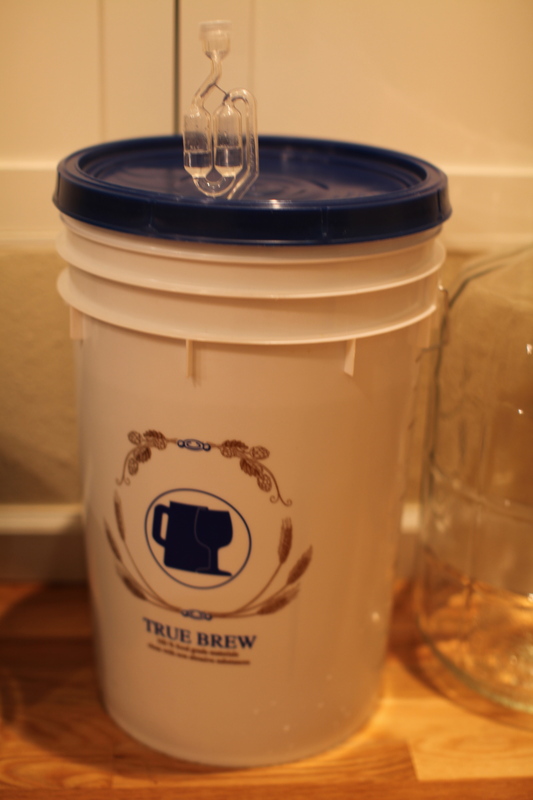 This weekend I took on my first home brewing attempt. They say making beer is pretty easy and just requires a bit of time. I used a Fat Tire Amber Ale clone kit so it was fairly easy to follow the directions to make the wort, which is the liquid extracted from the mashing process that will then be fermented into beer. As easy as it turned out to be it was a little daunting looking at all of this equipment. Luckily when you mention you’re brewing beer you often run into people who have tried it themselves and Matt, who I’ve gotten to know from the Boulder Wine Merchant, was nice enough to come brew with me and show me how it’s done. He walked through the process beforehand so I had an idea of each step. It’s also just nice to have someone to hang out with when brewing. It’s a lot of waiting and not unlike watching water boil. My one mistake was not following the directions on the back of the yeast packet. This stays refrigerated until you use it and I opened it thinking the packet was inside. No harm, no foul though since it ended up working fine. After bringing about 3.5 gallons of water up to 160 degrees we added in grains for flavoring and coloring. The smell transported me back to horseback riding as a kid and the smell of the horse food in the barns. It is pretty much like brewing up a big pot of horse food tea at this point. 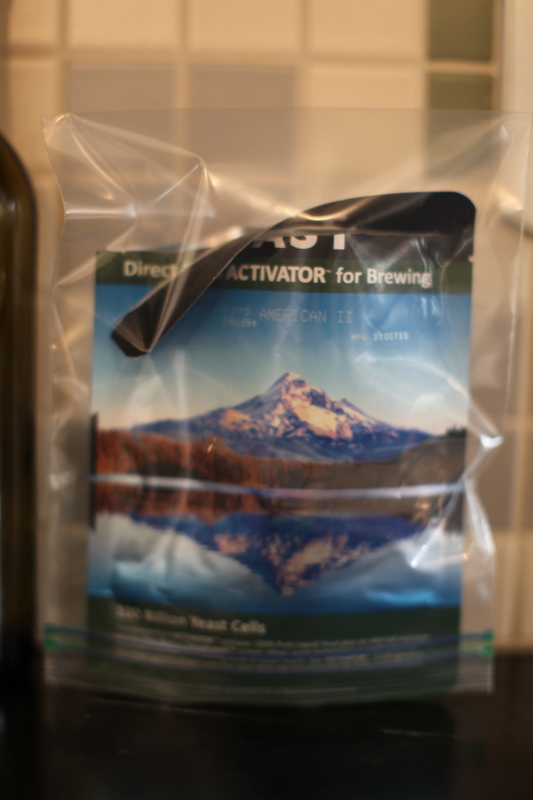 The kit I used already had a malt extraction which saves time in the process and also simplifies things a bit. It’s a good way to go when you’re starting out. 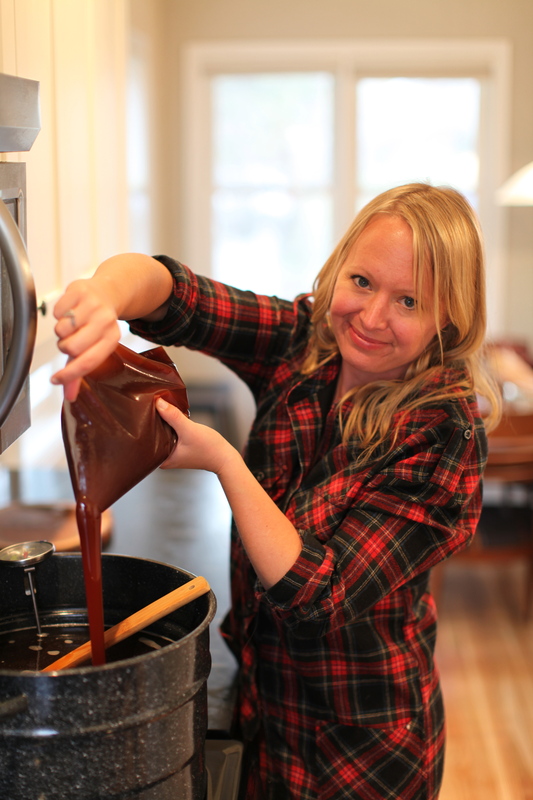 It’s essentially the sugary liquid you typically extract from the grains in an all grain brew. Matt has just graduated to all-grain after a couple years of brewing. Another important step to take in brewing is making sure everything that will be coming in contact with the wort is sanitized properly. It’s a little cumbersome in a kitchen sink. After adding in the malt extract, an hour long boil begins and hops pellets are added in at various intervals for flavor and then at the end for aroma. My house smelled very hoppy to say the least. After an hour of boiling, it’s time to cool down the wort as quickly as possible. I strained the 3.5 gallons of wort out into the sanitized fermentation bucket in an ice bath in the sink and then filled it up to the 5 gallon mark with cold water. For a little more $ you can get a wort chiller which is probably a good idea. It took awhile to cool down the mixture without it. After getting the temperature down to 70 degrees I added in the yeast and then made sure the lid was on tight. The kit also comes with an airlock valve. Matt gave me the tip of putting vodka into it instead of water. The water/vodka keeps bacteria out while allowing the yeast to breathe. I was happy the next morning to see the valve bubbling. The wort will ferment in there for a week and then I will transfer it to the glass container for secondary fermentation for another week. Then I’ll bottle it and let it ferment for a couple weeks further. All in all home brewing was a pretty interesting project. I can see it being a really fun thing to do with friends for an afternoon while partaking in a few already brewed beers together. Boulder has a lot of places locally for brewing inspiration and it’s the kind of community that likes to help each other out. We’ll see how my beginner brew turns out and maybe I’ll graduate onto more complicated brews. You are currently reading Wortin’ Weekend at 52 To Do.